Dada are a band from L.A. with a very distinct sound - lots of buzzy guitars with desert flavor mixed with high elements of psychedelia. They're sort of the perfect L.A. sound. You can imagine dada as a band playing under neon lights while there's a thunderstorm on the wind. 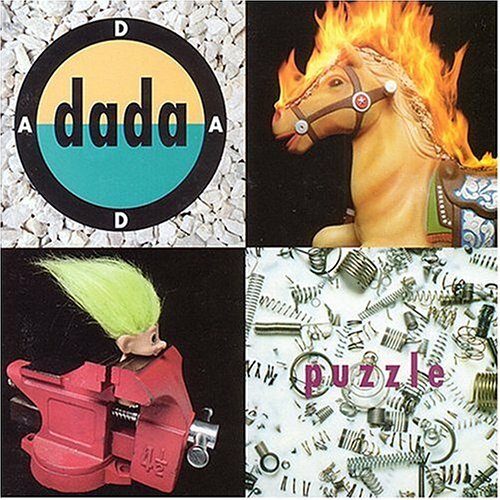 "Puzzle" debuted in 1992 with the song "dizz knee land," which was something of an indie hit, a sort of us-against-them anthem that connected with a lot of people my age at the time. It got the band a good amount of attention, for better or worse. There's something so wonderfully dizzy about dada's sound, those guitars from Calio that buzz and hum, hypnotic and yet rarely meditative. But it's not like that the only appeal - Gurley's bass work is solid and interwoven, and Leavett's drum work is complex while still approachable. But what really set dada apart was the fact that both Calio and Gurley take turns at vocal duties, and the two sound similar, but are still very distinct. dada put out four albums, broke up, got back together again, put out another album in 2004, and other than 20th anniversary tour in 2013, there hasn't been much from them, which is sad. I've always really liked the band. You should give them a listen.